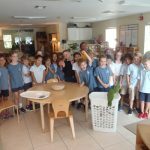 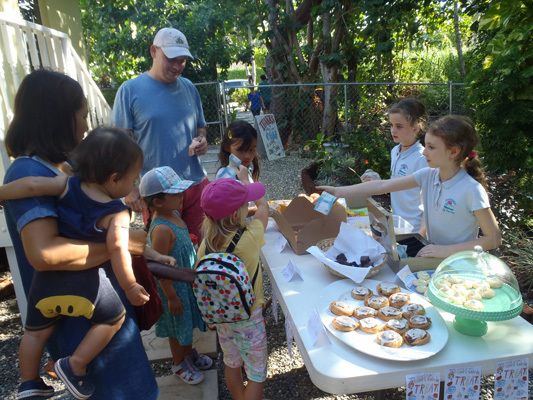 The children’s natural instinct towards environmental stewardship also shines brightly when they are given the chance to pursue their own ideas. 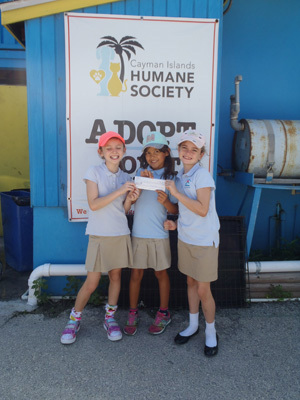 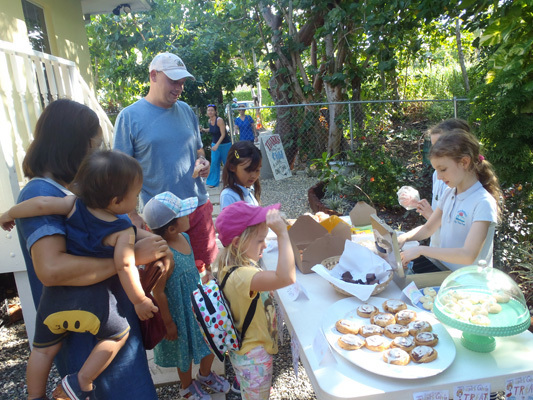 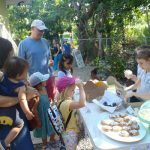 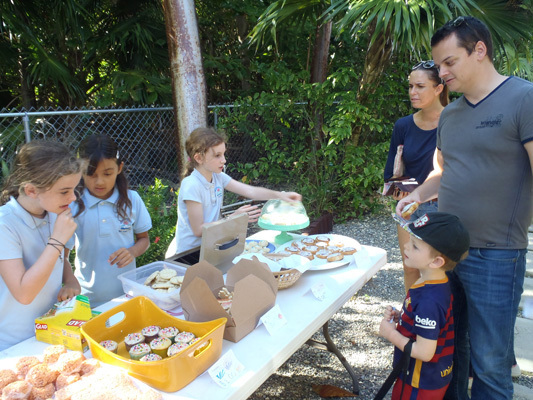 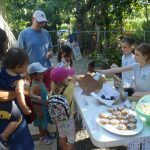 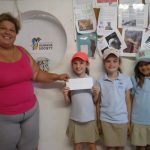 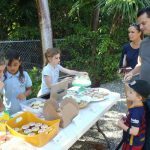 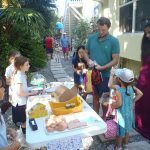 Earlier in the month, three third-year students took it upon themselves to organize the school’s very first bake sale of the year, in order to raise funds for the “poor animals without homes” at the Cayman Islands Humane Society. 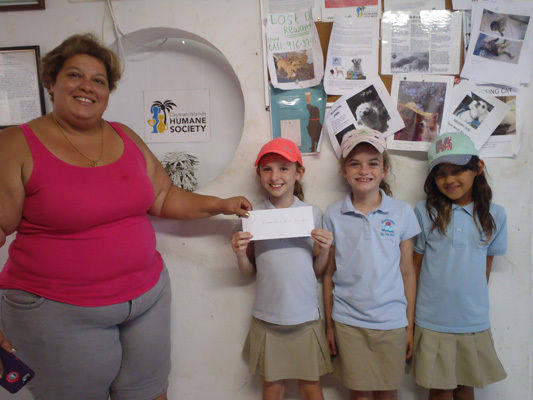 The three girls happily devoted themselves to the logistical aspects of planning, such as coordinating with the school administrators on appropriate dates, conceptualizing an engaging theme for the sale (Thanksgiving), designing an eye-catching, artful flyer with clear information, and going to the different classrooms around the school to publicize the sale. 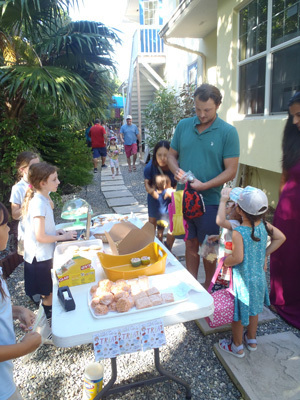 With the help of their own families as well as some generous donations from families in the community, the girls laid out a delectable spread of baked goods, and focused on applying their mental math skills as they quickly added up totals and worked out change – all while smiling and using grace and courtesy when dealing with their hungry customers! 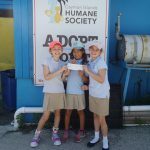 In the end, they were able to raise the fantastic total of $250.75, which they were then able to personally deliver to the Humane Society. 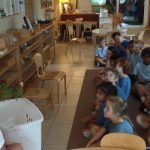 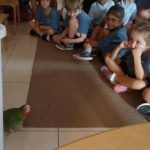 We also strive to cultivate a deep appreciation for the local flora and fauna by actively – and literally – inviting the wild outdoors into the classroom! 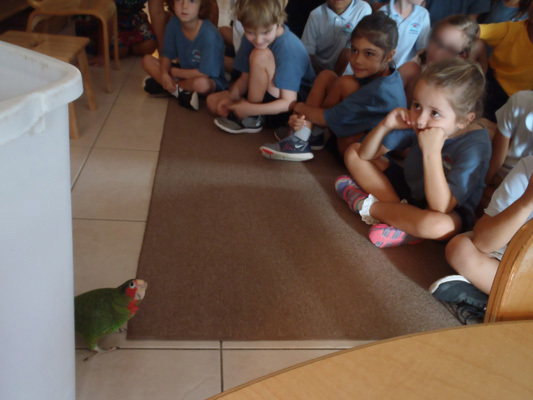 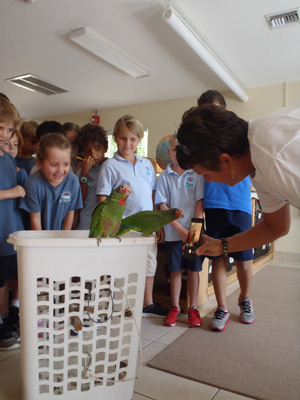 Both Lower Elementary classrooms were delighted to welcome Ms. Shirley Roulstone and her two fantastic, feathered friends, Cookie and Cracker. 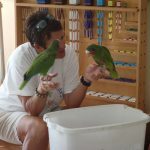 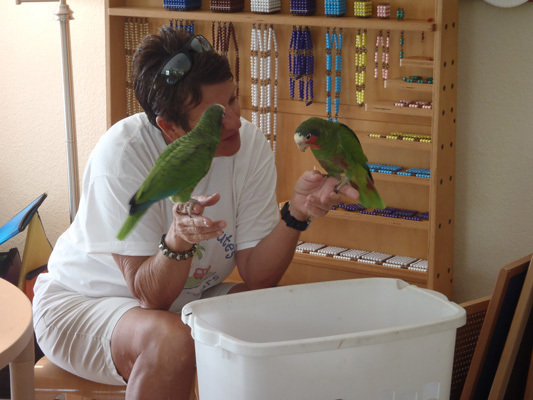 Cookie and Cracker are native Cayman parrots, which Ms. Shirley had rescued and nurtured into their current healthy and hearty state! 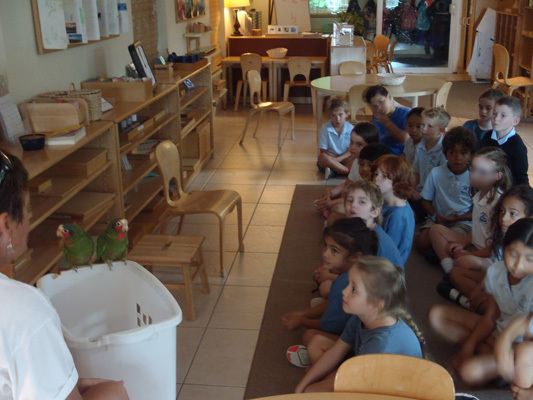 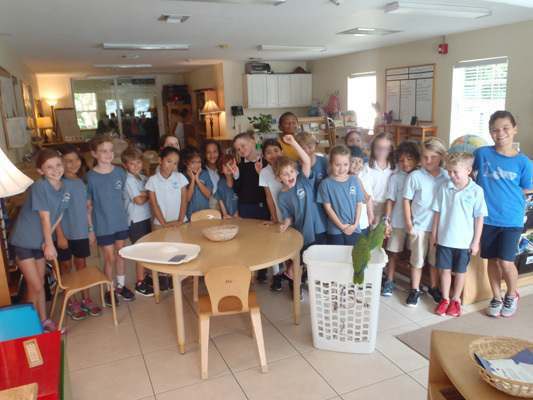 The children were enthralled as Ms. Shirley shared her extensive knowledge of the birds, and were clearly inspired by her selfless and passionate care for them. 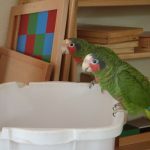 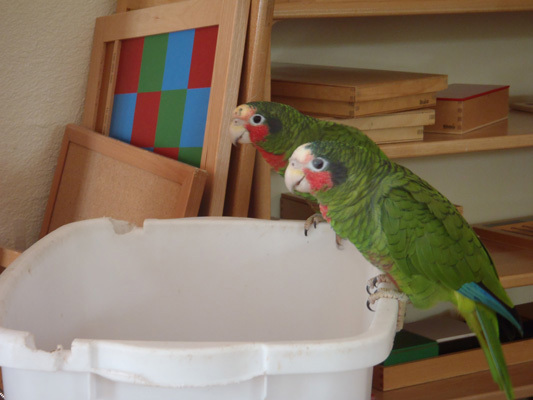 Once Cookie and Cracker got comfortable in the classroom, they went for a little stroll under a table and some chairs, and enchanted the children with their loveable antics. 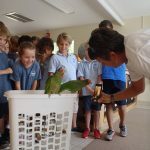 It was a wonderful, up-close experience with a treasured national symbol, and a vivid reminder that we share our precious island home with so many brothers and sisters, whether feathered, furry or finned.